ADI and our local partners secured a ban on wild animals in Colombia in 2013, which came into force in 2015. 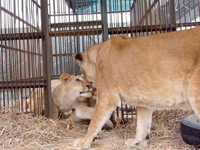 One circus handed over its lions as soon as the law was passed and so the CDMB, a regional wildlife authority in Bucaramanga, received 9 African lions in their rescue center. In September 2014, ADI agreed to take over responsibility and costs of the care of the lions at the CDMB so that these lions could join the flight to freedom with the lions from Peru. In Peru, next up was to collect lions that had previously been confiscated from circuses by officials and placed in temporary custody in zoos. Five year old lioness Kala, was collected from Huachipa Zoo. She had been confiscated from the circus but had been attacked by a cage mate at the zoo and lost part of her tail. There was no space for Kala and so she was living in a quarantine unit. Frightened and aggressive, Kala growled and snarled at the ADI team all the way back to our center. We later discovered that Kala is a daughter of Rey and Kiara, from the Cusco rescue. Three more lions, Ricardo, Junior and King were collected from Huancayo Zoo. ADI investigators had filmed them in the circus years earlier; we were steadily collecting animals we had met over the years. Ricardo still unconscious and dangerously overheated, using the mountain breeze to keep his temperature down. Everyone feared he would not make it, but there was relief and joy when he pulled through and walked unsteadily into his holding cage at the Spirit of Freedom Rescue Center. Three more lions were collected from Lima Zoo. One who was almost blind was just called ‘Blind’, so we named this lovely old boy Joseph. Two other lions had no names and were incredibly aggressive, hurling themselves at any people who walked nearby. We named them José and Liso – they are now content and gentle. By the end of October 2014, the two circuses with tigers and the three lionesses had disappeared, and reports of a circus with a mountain lion and a condor had dried up. That left just one we had located in Arequipa with three lions (father Muñeco, David and Rapunzel), but it was now hiding in the jungle. So we waited. Many weeks later the circus was sighted heading back towards Arequipa, but Muñeco had died. We returned for David and Rapunzel and the circus promised to remain animal free. We announced to the media that this was, essentially, the end of wild animals in Peru’s circuses – but the public should be vigilant and contact ADI if they saw any animal circuses. Months later, our constant alerts would pay off as we swept up more missing animals. Our collaboration with Peru’s SERFOR and ATFFS extended to the illegal wildlife trade, their public awareness campaign ‘Tu Casa No Mi Hogar’ (your house is not my home) and assisting with animal victims. The first animals saved were three male capuchin monkeys handed to us by Lima’s ATFFS: Loquito, Pedrito and Dr Mel (honoring our sadly departed veterinarian Dr Mel Richardson). In November, the numbers steadily increased when ADI agreed to take the animals from a closed down police facility for confiscated animals. ADI captured and removed a tortoise, 2 kinkajous and 8 capuchin monkeys. had been alone all his life, met the young female spider monkey, Valerie. Pepe’s and Valerie’s family soon grew, though, when two more spider monkeys were removed from a small circus in Lima. They were quickly followed by two more from the illegal wildlife trade. The spider monkeys were placed in separate units alongside each other and eventually to much monkey laughter, chattering and playing, a whole family was created! More monkeys, coatis and kinkajous kept coming; we carried on building up the animal families and by April 2015, ADI had in our care 39 native wild animals, including woolly monkeys, spider monkeys, owl monkeys, squirrel monkeys, black capuchins, white capuchins, kinkajous and coatis.